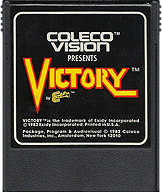 ColecoVision.dk presents: Victory © 1982 by: Exidy Inc. 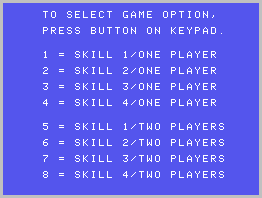 Initially © and Licenses: Exidy Inc. 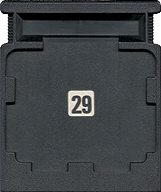 Original Programmer and/or Designer: Vic Tolomei, Exidy Inc.
ColecoVision PCB Size, Type and Producent: 20kb., Coleco Inc., Coleco Inc.
ColecoVision Cartridge #, Casing and Producent: ICC 244601 / 4L4065, Standard Black U.S., or European Style, Coleco Inc.
ColecoVision Manual # and Manufacturer: 2L2267 / 14338, CBS Electronics UK. Coleco Inc. USA. ColecoVision Box Art and Design by: Unknown. Coleco Inc. Publisher and Year: Ideal Toy Co. Ltd. a division of CBS Toys, 1983 Coleco Inc. Your planet has been overrun by an alien force. They've installed radar, rockets and quark silos. Their deadly ships drop paratroopers to release the quarks. You must stop them !. Fire your lasers to destroy the aliens. If the going gets rough, put up your sheilds or trigger your Doomsday Device. 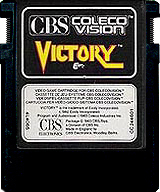 My rare USA ColecoVision Victory above is the 1st version, labelled: ColecoVision presents. The 2nd USA version was labelled: For ColecoVision & ADAM Family Computer System. XName: James Carter. XName: XName: Johnny Jensen. XScore: 1.051.150 - June 10, 2002. XScore: 0 - XScore: 476.150 - May 21, 1989. ColecoVision.dk Game # 29, Victory is last updated: December 27, 2017.